In large glass or plastic bowl, mix yogurt, mayonnaise, dill weed, mustard and salt. Add all remaining ingredients; toss. Cover and refrigerate about 4 hours or until chilled. 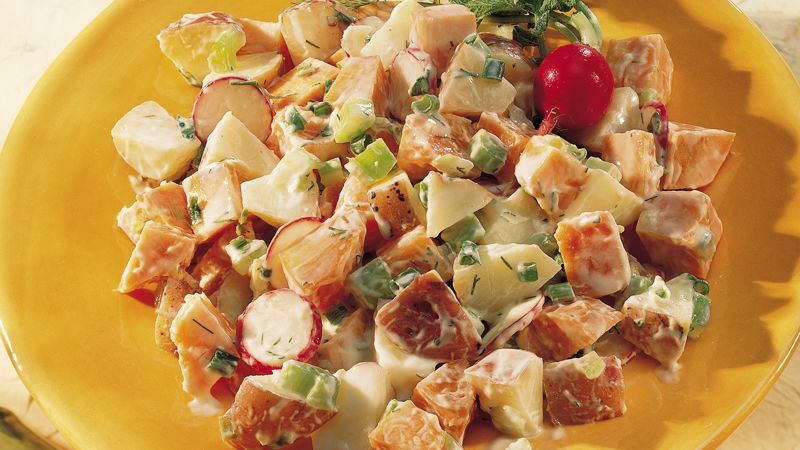 Round red or white potatoes are best for potato salad because they hold their shape when cooked. Yogurts that contain live cultures are often well tolerated by people who are lactose intolerant. The naturally occurring bacteria in yogurt may help break down lactose, making it more digestible. Read labels to find those with "live cultures."